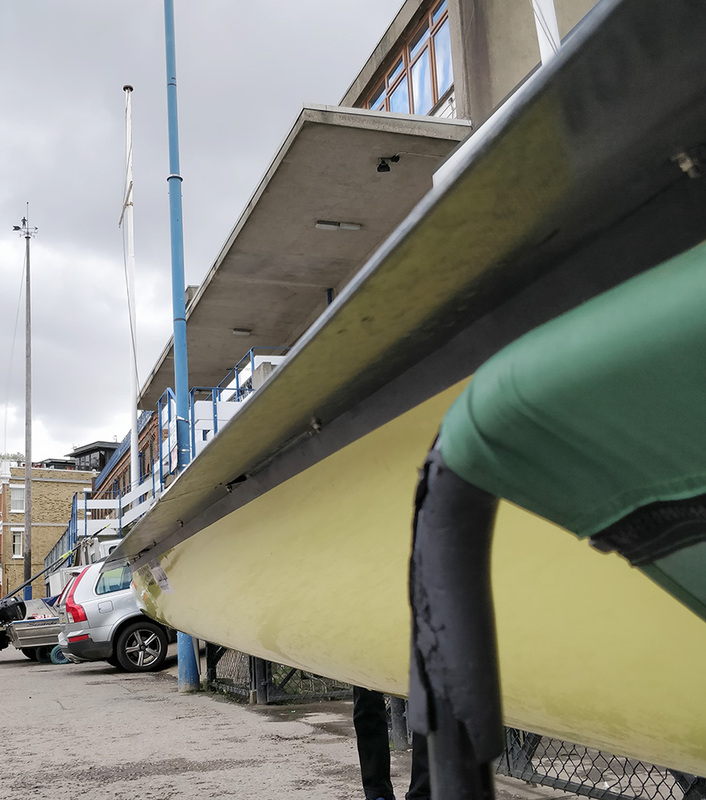 With the Boat Races taking place today, you may have wondered how the Oxford and Cambridge Boat Race crews try to stay dry, there are a number of ways. Bolted to the underside of the gunwale flange are some custom made wide boards. Made from sheets of a carbon-foam-carbon laminate and cut in sections to neatly match the shape of the boat. 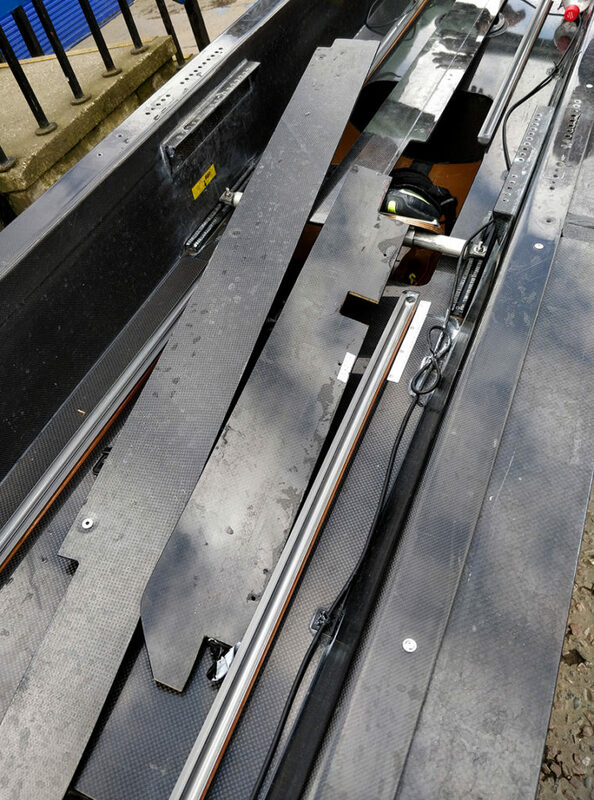 The extra 10cm or so width helps to keep the water out, but it looks like they would be a time consuming pain to fit and remove, and carrying the boat would be much more difficult. These boats also have a larger freeboard height with about 40mm added to the height of the gunwales. This would be easy enough to build as it would only require some extra sections to be added to the standard production mould in the factory. 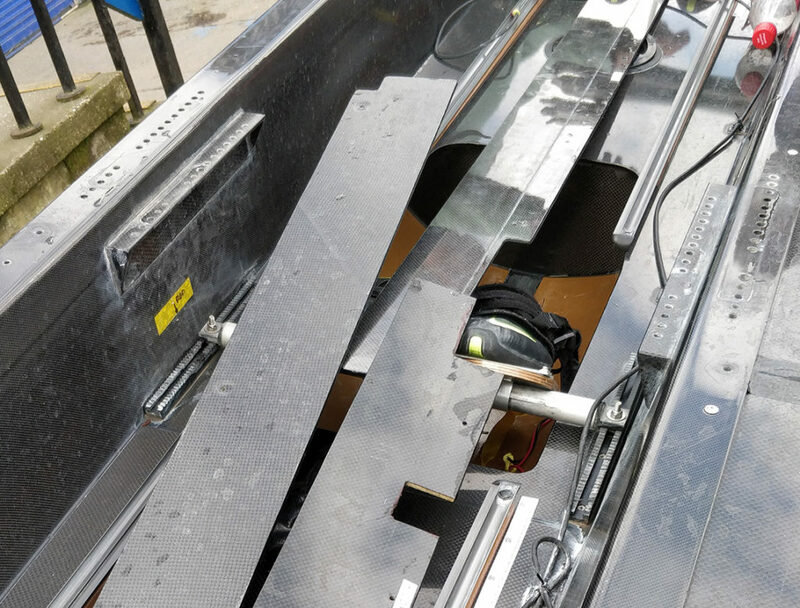 To ensure clearance for the hands, one of the rigger mounts is now inside the boat (instead of on the other gunwale flange) on a special carbon section. See the twin sets of mounts on each side of the hull. Enlargement of image showing extra rigger mounts. The riggers are custom made to allow for this difference in height. Easy with alloy wing riggers (as per the Goldie boat), but the carbon riggers on the Blue boat must have required some special work. I can only presume that a whole new set of moulds were needed – not cheap! The boats for both universities have used electrically powered pumps for some time. The coxswain’s seat has a switch to activate these. The technology has improved steadily over the years and the current designs are very light and powerful. Lithium Ion battery packs are a welcome improvement over the old heavy lead-acid motorcycle batteries of years gone by. I wasn’t able to see the details of the pumps, but each boatman has their own special tricks and ideas about the best way to set these up. Differences between the clubs would include number of pumps (one per seat, one per two seats), location of piping, types of valves used (to prevent air-locks in the pipes for eg) and so on.